I’ve always had a fondness for the magic of cookie making – how a simple dollop of dough can transform into delicate, delightful cookie in a matter of minutes. In my opinion, there little that’s more appealing than a tin or plate full of freshly baked cookies, especially if they’re still warm from the oven! These are a twist on the classic chocolate chip cookie, using rich muscovado sugar for a caramel background and featuring the cute perfectly formed mini chocolate chips from Doves Farm. They’re not the cheapest and come in a dinky little tube, but they’re gluten, dairy, nut and soya free and are about as cutely perfect as a chocolate chip can be. None of those misshapen clumsy dollops so often found in free-from food! 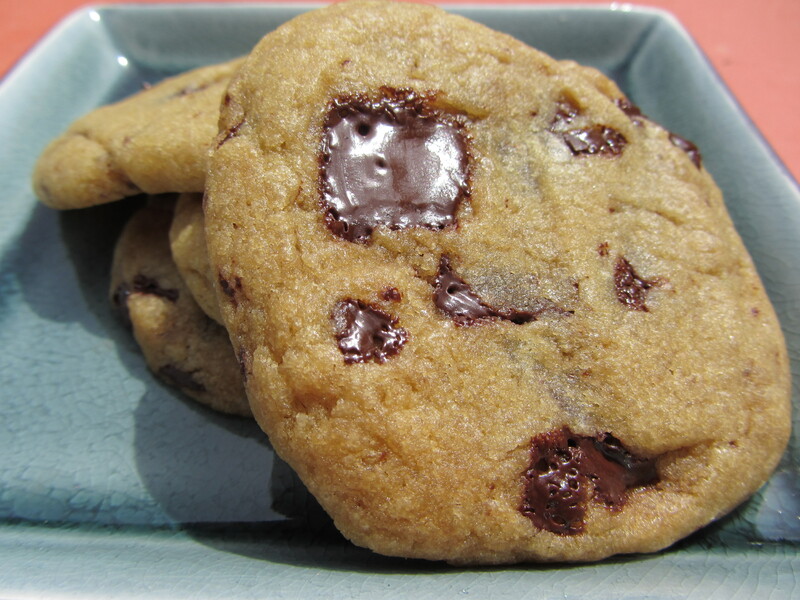 I would really really recommend this recipe – it makes the perfect chic chip cookie – crunchy and crispy around the edges with a softer interior – who could ask for more! Whisk together the oil, oat milk, sugars, vanilla and cornflour. It will combine to form a smooth caramel. Sift in the flour, bicarb and salt. Mix well. Roll into walnut sized balls, place slightly apart on the baking sheets and flatten a little. Let cool on the baking sheets for a few minutes before moving to a wire rack. Tomorrow is St Patrick’s Day, requiring the cooking of some Irish food. I was planning on making some chocolate and Guinness cupcakes but couldn’t source any vegetarian stout, so I had to shelve that plan! 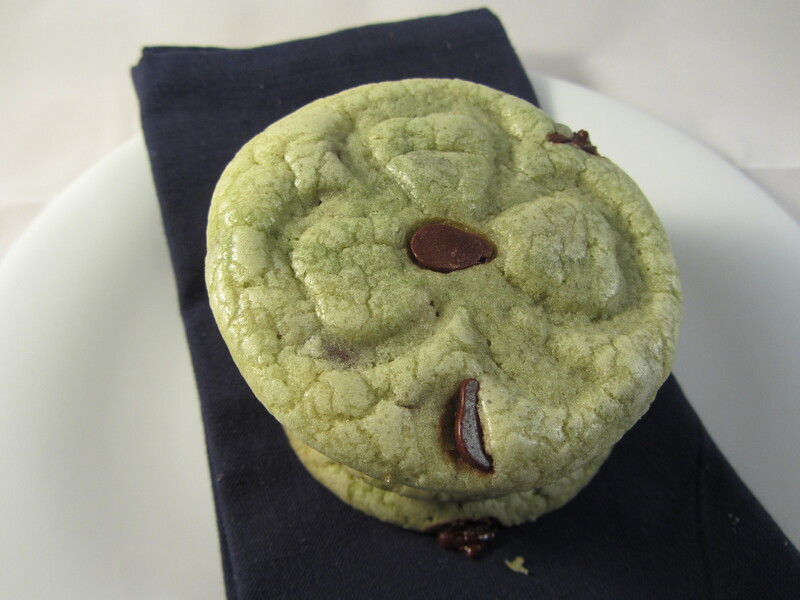 In the end I opted for these scrummy mint chocolate chip cookies, tinted green (of course) with natural food colouring. 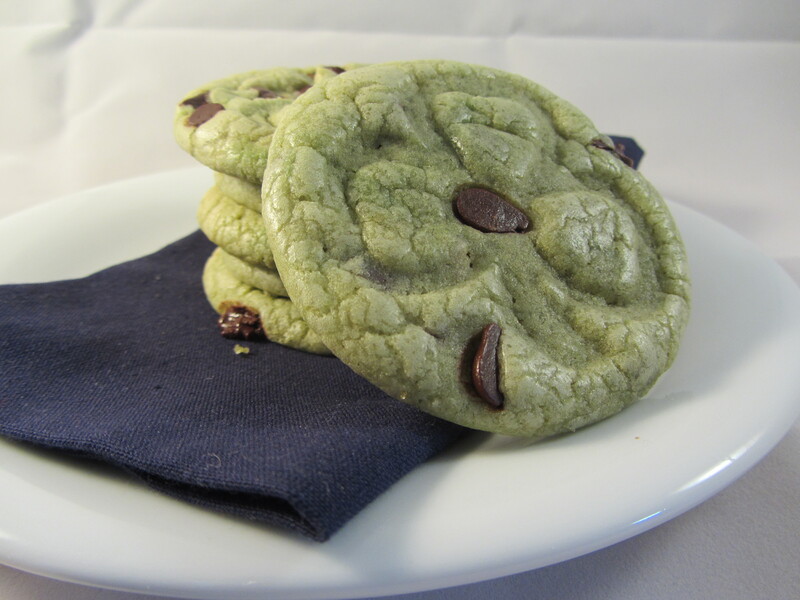 By all means, alter the amount of mint essence or food colouring to your preferred taste, this version has just a hint of mint and a light green hue. 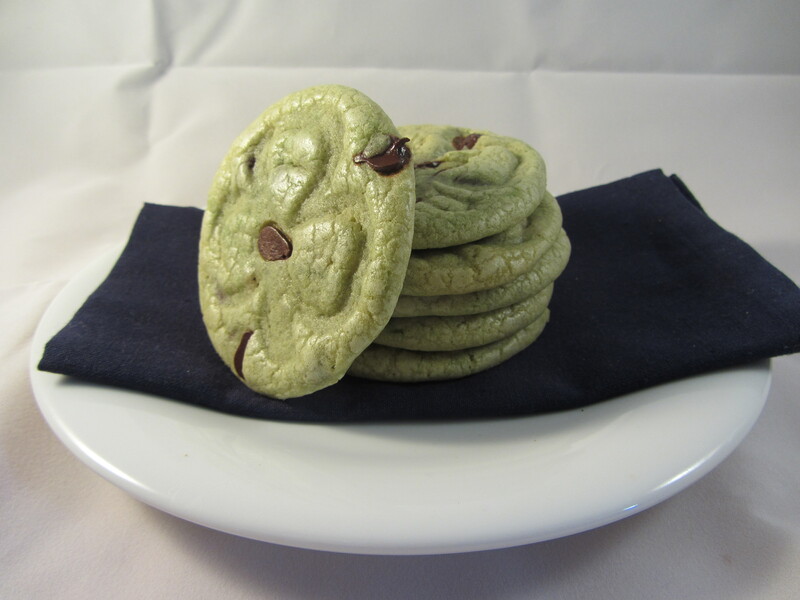 – Whisk together the oil, oat milk, sugars, mint, food colouring and cornflour. It will combine to form a smooth caramel. – Sift in the flour, bicarb and salt. Mix well. To compound my difficult week… and returning to work has certainly been very hard, tomorrow we’re taking Little S for her rearranged peanut challenge. I don’t feel quite so nervous this time, but that’s just because I’ve had other things on my mind! I’m sure tomorrow will bring the same ‘sick to my stomach’ feeling – I know it’s good we’re doing this challenge but I hate to think that Little S is going to be really sick. The positives are that me might find that her peanut allergy isn’t so severe, and we’ll be confident in her recognising any future reaction. Still, I’ll certainly be very glad when it’s over…. To make the journey home a little more fun, I’ve made some classic american style chocolate chip cookies – the perfect treat-like comfort food. 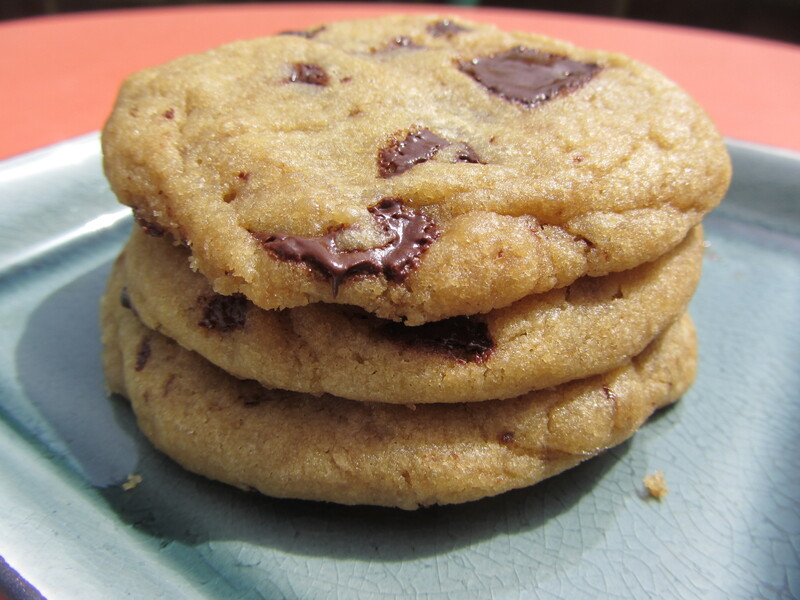 I’ve always found Classic Chocolate Chip Cookies without eggs and dairy surprising difficult to make – either too oily or too flimsy. This version works well, and is certainly what you’d expect from a CCC. – Cream together the dairy-free spread, icing sugar and vanilla until light and fluffy. 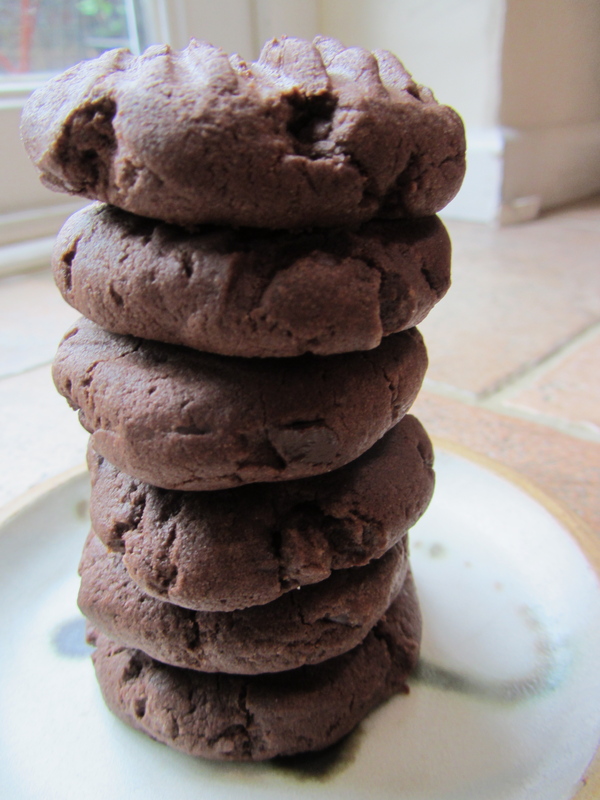 – Sift in the flour, cornflour, cocoa and salt. Stir until well combined. – Roll into 12 even sized balls and place on an un-greased baking sheet. – Flatten slightly with the a fork. – Leave to cool on the baking sheet before moving to wire racks. 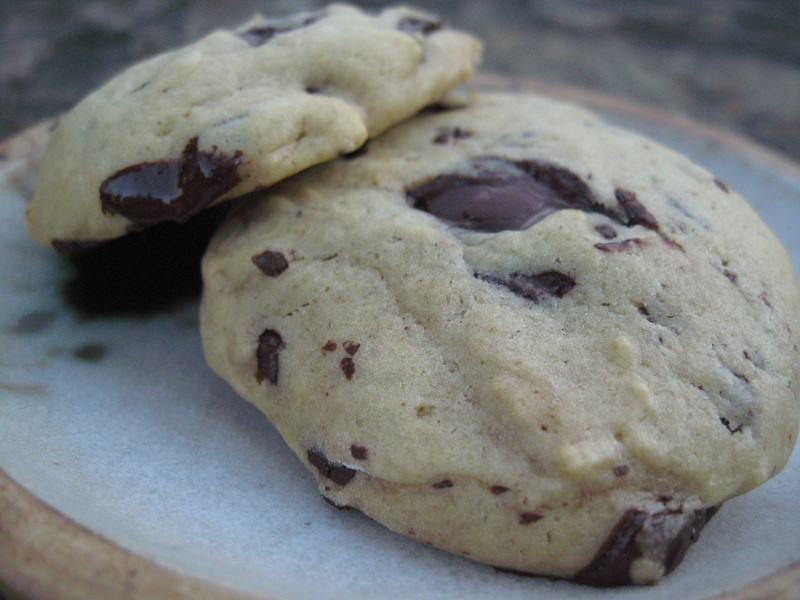 Here’s a chocolate chip cookie recipe that robust, soft, cakey and a little more substantial than your delicate cookie. They travel brilliantly so are much more suited to a picnic/journey than your usual version, and keep for much longer. I think they make a great, never-fail speedy recipe should you have kids coming over to play. 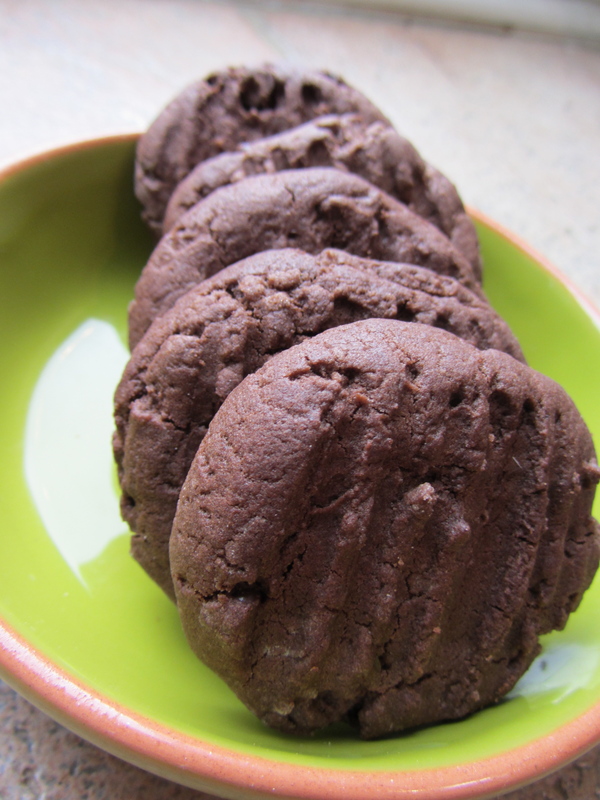 (This recipe comes from Vegan Cookies Invade the Cookie Jar). It’s the school holidays and we’ve got a jam-packed week of play-dates coming up, so I thought it best to get prepared in advance! – Whisk together the sugars, melted dairy-free spread, oat milk, vanilla and cornflour. – Gently stir in the chocolate. – Cool on the baking sheet before moving to a wire rack.